Minister of the Interior of the Independent State of Croatia and one of Ante Pavelic’s most trusted deputies, later becoming the highest-ranking war criminal to find safe haven in America. Studied at a Franciscan monastery at Siroki Brijeg in Hercegovina, led uprising in Velebit Mountains in the 1930s, escaping arrest and joining the Ustasha movement in exile. In England in 1934, allegedly planned a second conspiracy to assassinate Yugoslav King Alexander should the Ustasha’s plot in Marseilles fail, for which he was arrested but later released. 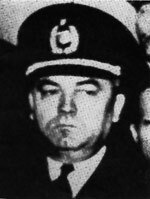 Named Interior Minister of the Independent State of Croatia after the Nazi invasion of Yugoslavia, April 6, 1941. As Interior Minister approved practically every aspect of the Ustasha terror, and personally ordered the extermination of 4,000 Serbs in his native Siroki Brijeg in May 1941. Approved construction of a system of concentration camps in September 1941, including Jasenovac. Fled with Pavelic, Archbishop Ivan Saric and other Ustasha leaders to Austria in May 1945. Allegedly freed by British from detention camp in Spittal. Deviated from the usual Ratline escape route, hiding first in Switzerland and then Ireland until entering the United States on July 16, 1948 on a tourist visa obtained with a forged Irish identity certificate. Through a mystifying pattern of logic, an immigration judge stayed an order of deportation indefinitely, saying that Artukovic would suffer from “physical persecution” should he be deported to stand trial on war crimes charges in Yugoslavia. The case was reopened more than twenty years later, and Artukovic was finally deported in 1986, primarily due to an outcry by Jewish organizations. Became a martyr for right-wing American groups who continue to plead his case as a red herring for anti-Semitism. Tried and sentenced to death by firing squad in Yugoslavia, Artukovic (who was by now enfeebled) was in custody of Croatia a prison hospital there in 1988 when he died.